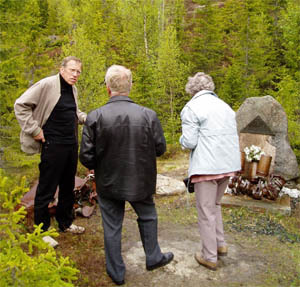 In late May 2005, I travelled to Norway to spend several days in the Hemnefjord area with Wynne Hines and David Hall, the relatives of two 10 Squadron airmen who were lost during the March 1942 attack on Tirpitz. Six Halifax aircraft failed to return, two 10 Squadron Halifaxes were lost in the Hemnefjord area at approximately the same time during the operation, W1043 ZA-F flown by S/L F Webster and W1044 ZA-D flown by P/O N Blunden. Wynne, sister of 22 year old Pilot Officer Sam Leney an air gunner onboard Halifax W1043 ZA- and David, son of 30 year old Sergeant Eric Hall the second pilot onboard the same aircraft were making their first trip to Norway. In 1942, Wynne was a young 18 year old working as a counter clerk at the local Post Office in Mitcham, Surrey where her parents ran the Bucks Head pub. 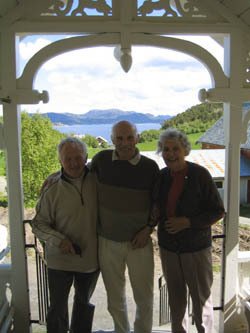 Her other brother, Leslie was in the Royal Observer Corps. When the telegram informing the Leney family that their son was missing arrived at the Post Office in Mitcham, Wynne had just returned to work from home after having taken her lunch break and was puzzled when she was instructed to return home again immediately. On arriving back home she was told the dreaded news by her parents that her brother, Sam, had been posted as missing having failed to return from his last operation. 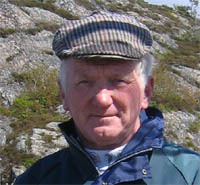 David Hall was only 15 months old when his father, Eric, failed to return leaving behind a wife, Florence, with three young children, Jill, then aged 3 and David and his twin sister, Carol. The programme for our visit to Norway was organised by my good friend and co-researcher, Morten Moe with assistance from myself and two wonderful Norwegian friends of ours, Marit Lian & Håkon Helland, both from Kyrksæterøra. Wynne and David arrived at Værnes airport just outside Trondheim where Morten and I were waiting to meet them. I had flown in from Scotland a few hours ahead of them. Our first port of call was to drive to the top of Forbordfjell, a hill close to Fættenfjord which affords an excellent panoramic view of the surrounding area over Fættenfjord, down Trondheimfjord and east towards Sweden. On the way back down we stopped to pay our respects at a small memorial to PRU pilot Flying Officer Frederick Ian Malcolm whose Spitfire AB 127 crashed on 10th May 1942. 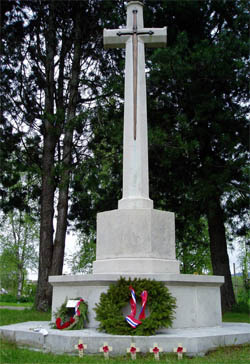 Parts of his aircraft have been placed beside the memorial. Flying Officer Malcolm was shot down and killed while on a reconnaissance flight to photograph the German Battleship Tirpitz by a German pilot, Oberleutnant Herbert Huppertz who was Commander of 9 Staffel Jagdgeschwader 5 based at Lade aerodrome. 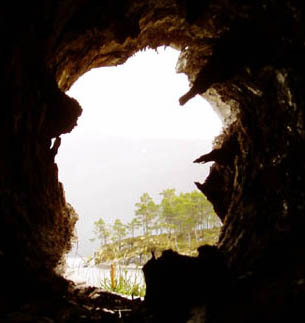 The Spitfire crashed into the side of Forbordfjell some three miles to the south of where Tirpitz was moored. 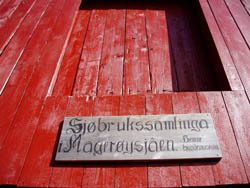 He now rests in Stavne Cemetery, Trondheim. We continued along the E6 and made our way to the head of Fættenfjord where Tirpitz had been moored during the 1942 air attacks. 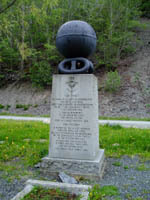 Here there is a memorial in memory of the allied aircrews killed in attacks and reconnaissance on Tirpitz while she was berthed in Fættenfjord which was erected in 1985 by the local people. I placed a small cross of remembrance here on behalf of Ron Waite from 76 Squadron in memory of his friend Squadron Leader Burdett whose Halifax R9453 was lost without trace somewhere off Shetland on route home to base after the March 1942 attack on Tirpitz. Ron Waite himself flew on both the April 1942 attacks. Our next stop before continuing our journey to the Hemnefjord area was at Stavne Cemetery in Trondheim. 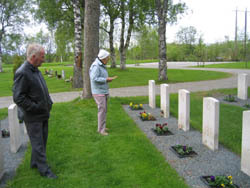 This cemetery contains the largest Commonwealth War Graves Plot in Norway, and it is here that my grandfather, F/Sgt W B Archibald, and two other members of his crew, Sergeant A M McLaren and Sergeant D Francis are buried along side many of the others who lost their lives during the attacks against Tirpitz. There are a total of 155 Commonwealth War Graves of allied servicemen from WW2 at Stavne. 27 Navy, 24 Army, 99 Air Force, 5 Merchant Navy, of which 140 are British, 6 Canadian, 5 Australian, 3 New Zealand and 1 South African. David and Wynne placed a small cross of remembrance on the grave of Squadron Leader Webster, the pilot of Halifax W1043 that their relatives were onboard. His was the only body from the crew recovered after the crash. During our visit to Stavne I also placed remembrance crosses with messages from their relatives on a number of airmen's graves and at the base of the cross of sacrifice for those who have no known grave. The cemetery is beautifully maintained, each grave had several pansy plants in flower which, when I visited again a week later had been replaced by geraniums and spreading purple flowers. 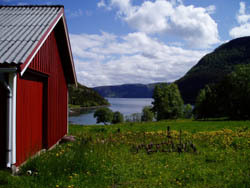 We continued our journey, stopping for provisions at Orkanger, and arrived at our cottages some time between 2100 and 2200 hrs. 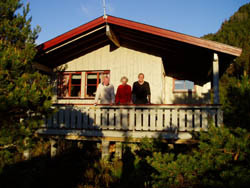 Marit had very kindly assisted me in finding accommodation for the duration of our stay, beautiful wooden cottages on a hillside at Belsvik. From our veranda we could just see Hemnefjord through the trees. 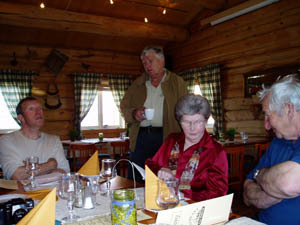 We were warmly greeted by Marit and her husband, Jan Even, who were waiting for us with home made moose stew and a bottle of wine. After a long day travelling it was just what was required. 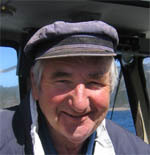 Also joining our little party for the evening was the charismatic Håkon Helland who would be taking us out on Hemnefjord in his boat the following day. We had a most enjoyable evening talking, eating, drinking and exchanging news. It was a lovely way to end our first day in Norway. Our first full day in Norway, and it was to be a busy and memorable one. After breakfast we drove to Heim, past the churchyard where three of the airmen from Halifax W1044, Sgts Day, May and Richards were originally buried before being moved to Stavne, Trondheim after the war. 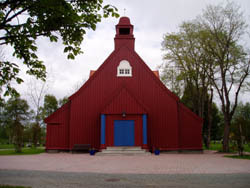 During the war German soldiers had been staying at the farm next to the churchyard at Heim which was where Marits grandparents (The Olsen family) and their seven children lived. Mrs Olsen later told her daughter that she could remember that one of the German soldiers was very religious and it was he who conducted the funeral service for the British airmen with prayers and singing at the grave. 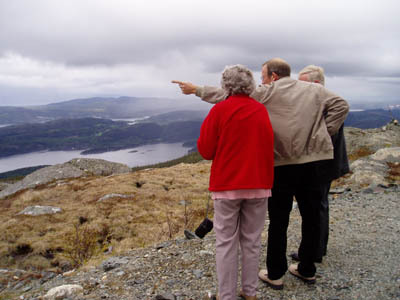 We stopped to take in the view of Hemnefjord, for David and Wynne this was their first sighting of the place where their relatives had lost their lives. Our next stop was at Stamnestrøa Farm where Håkon was waiting for us, a Saltire and Union Jack flying in our honour! 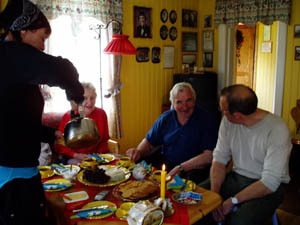 Marit had arrived ahead of us and had already prepared some coffee which we sat down to enjoy in Håkons house overlooking the fjord. After coffee we boarded Håkons boat, Vendla, and started our tour on the waters of Hemnefjord past the points of Oterneset and Hamnasteinen where the bodies of some of the airmen from the other 10 Squadron Halifax W1044 had been recovered from the water in the days after the crash. We continued out into the fjord past the small islands of Fuglan and Sorfuglan where wreckage from one of the Halifaxes was found both in the sea and on the island, on past Fugløy and Tynsøy where people who lived on the islands in 1942 could remember hearing the aircraft flying over, the noise of the AA guns shooting and finding aircraft debris and wreckage the following day as well as many dead fish washed up on the shores. We stopped the boat at the point in the fjord between Sørfuglan and Jamtøya where we believe Halifax W1043 came down with the loss of all onboard. 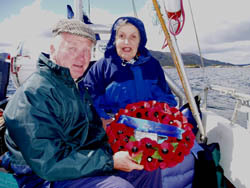 David placed a wreath on the water and we paid our respects to the airmen who had lost their lives. 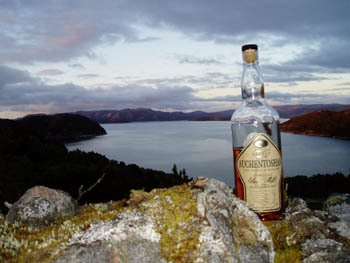 A dram of malt whisky was poured into the fjord for the men. It was an incredibly emotional moment for us all, but in particular for Wynne and David who were at last able to say a farewell to the family members they had lost there. 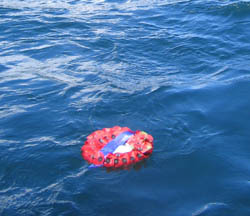 We watched as the wreath drifted away from the boat, everyone silent with their own thoughts. 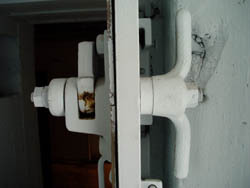 Before leaving the area, Wynne threw a watertight container overboard. Inside were photographs of her brother Sam, David's father, Eric, and information about the airmen, the loss of the aircraft and the crew. 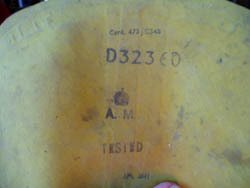 Hopefully some day it will be found and the finder will learn about the loss of W1043 and the brave young men onboard. With two farewell blasts on the boats horn we were underway again and heading for Hemnskjel where we stopped at the Hemnskjel Feriesenter restaurant to have a meal. 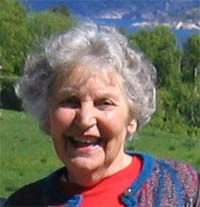 We were joined by 82 year old Karoline Utseth. 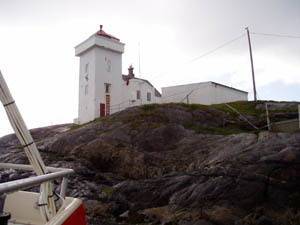 As a young girl she had lived on the nearby island of Terningen where her father was the lighthouse keeper. She remembered the day the body of Squadron Leader Webster, pilot of Halifax W1043 was washed up at the quayside there and recovered by German soldiers stationed on the island. On April 8th 1942, Squadron Leader Webster was buried at Trondheim Stavne Cemetery along with four airmen from 35 Squadron who had perished when their two Halifax aircraft had been shot down on the night of 30th March. 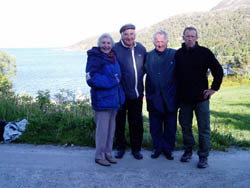 They were Flight Sergeant Steinhauer from W1015 TL-P, Flight Sergeant Archibald (my grandfather), Sergeant Francis and Sergeant McLaren from R9496 TL-L.
After a very enjoyable meal, Ragnar Volden, the owner, and Karoline kindly drove us to a high point on the island at Vollahaugen where the Germans had a bunker and gun position. 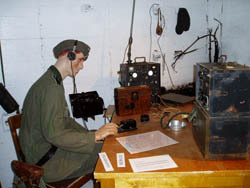 It was the command centre for the German coastal artillery group in the area, Artilleriegruppe Drontheim West, commanded by Haptmann Hufnagel during the war. 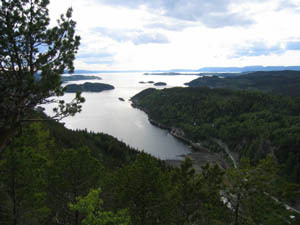 Hemnskjel played an important part in defending the route to Trondheim by sea and air. 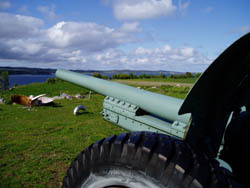 It has 12 coastal batteries under its command and was responsible for defending an area from Kristiansund to Ørlandet. When the Germans arrived at Hemnskjel in May 1941 they constructed two coastal forts plus AA positions. 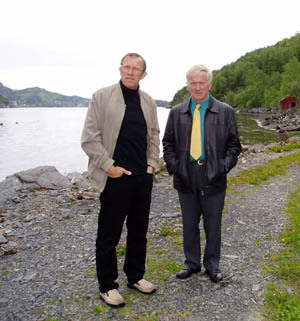 This was a very important location for defending the air and sea routes to Trondheim. 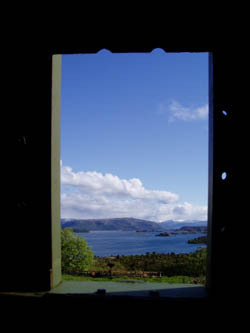 From their command HQ at Vollahaugen they had a good view of Hemnefjord and were also able to keep watch on shipping coming to and from Trondheim. 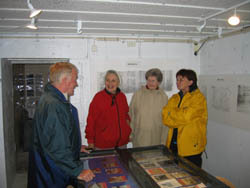 The bunker has been transformed into a small museum. Inside much is as it would have been when occupied by the Germans with the addition of photographs, maps and displays to help tell the story and give the history. 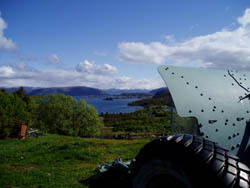 A refurbished 105mm gun stands above the underground bunker and you can see from the photographs that in this position it had an excellent view over the surrounding fjords. Back on the boat again we routed via Terningen, past the lighthouse and quay where the body of Squadron Leader Webster was recovered in the days after the loss of W1043. The final stages of our journey on Hemnefjord took us through the narrow gap between the mainland and the islands of Ytteröya and Stamnesöya and back to the jetty below Håkons farm at Stamnestrøa. 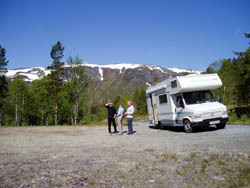 We enjoyed a leisurely start to our day before being collect by Marit who took us on a sight seeing tour in the surrounding countryside so that we could enjoy some of the spectacular scenery Norway has to offer. Our drive took us to Hellandsjøen where we looked at an old general merchants store now being run as a cafe and we also visited Hellandsjø Skinnsøm, a small factory that produces quality handmade moose and deer skin products. We continued our drive along the side of Mistfjorden and stopped to take in the view at lake Reinsjøen before hopping over the island of Skarsøya using the bridges. We stopped at a little fishing port, Eidestranda, where David and Wynne found a place selling fresh fish and bought some to make a meal with later. We ate lunch at Aure and then took the ferry from Aresvika to Hendset and drove along the southern shore of Vinjefjorden and stopped at Vinjeøra for a meal. We stopped for coffee at Marits home in Kyrksæterøra before returning to Belsvik for the evening. 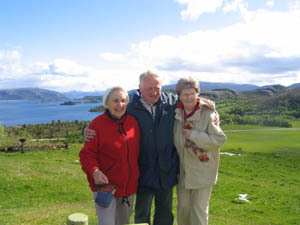 It was lovely to be driven around and shown the sights and scenery. A huge thank you to Marit for taking the time to do this for us. It was so relaxing that I simply sat back and enjoyed the trip taking only one photograph all day! Our final full day in the Hemnefjord area. 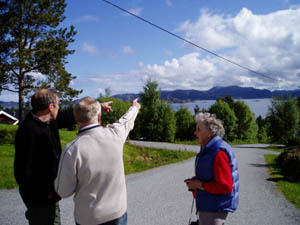 We returned to Heim and visited Tormond Moe who still lives in the farm opposite the church that his family stayed in during the war overlooking the bay of Innervågen and Hemnefjord. Tormond had coffee waiting for us and we drank our coffee he produced the inner part of a life jacket that had been recovered on the shore in the days immediately after the loss of Halifaxes W1043 and W1044. Members of his family had been involved in the recovery of some of the bodies of the airmen from Halifax W1044. A journalist from the local newspaper, Søvesten, had heard that Wynne and David were visiting the area and wanted to write an article for the paper about their visit. 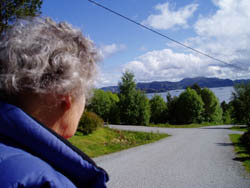 We arranged to meet her at Håkon Hellands place so made our way round there to find she was already waiting for us. 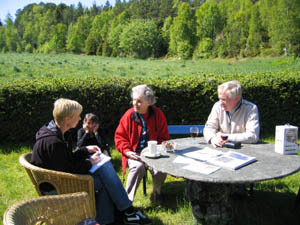 We sat outside in the sunshine while journalist, Edna Hovden, spoke in turn to both David and Wynne with Morten and I helping to fill in additional information where required. The article appeared in the newspaper on Thursday 9th June. 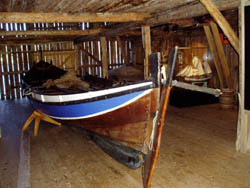 After bidding Edna farewell we set off in Håkons boat to spend some more time out on Hemnefjord. We stopped off at the island of Magerøya to look at the small museum there and did a spot of fishing from the boat on the way back to Håkons again. The end of the trip for David and Wynne. Before heading back to Værnes airport we took a final drive to Heim in order to take a last look at Hemnefjord. For David and Wynne it had been an emotional few days but also incredibly memorable ones. Grateful thanks to Morten Moe, Marit Lian, Håkon Helland and all the wonderful people we met during our visit who went out of their way to help us and made us feel so welcome.